Hello, our names are Jim and Christine. 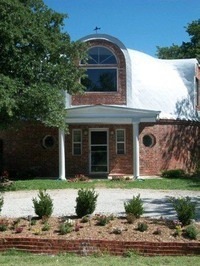 We are in the process of building a concrete domed house (Claddagh Dome) outside Azle, TX, which is in Parker County. We are building a 40 foot dome on an 8 foot stem wall. It is a two story with 4 bedrooms, 2 ½ baths. There are 2200 square feet of floor space and another 200 square feet of open area. Our lot is almost a half of an acre which has trees. The front of the lot faces south. We were looking for a lot that we could get the southern sun during the winter. We are in a sub-division which is older with no HOA’s and not a lot of restrictions. There are a few log homes, barn style houses and an A frame. We figured that we would not be upsetting the square and rectangle home owners, with our dome, because of the other unique homes already in the sub-division. Let me back up a bit and say that it took my husband almost ten years to convince me to build a dome home. I had the typical view of wanting what everyone else had, just in my floor plan. My husband has been very patient and has gotten me to change my mind by telling/teaching me all the benefits of a dome. I had to get over what the Jones’ were doing. Now that I have come around, I am thrilled to be able to build a dome. We have decided to build as much of our dome ourselves to learn the whole process. Jim did take a dome building class at MDI and really liked the class and learned so much. If you have the chance, Jim highly recommends going. We have received helpful tips from many of you through the discussion board and personal web pages. We thank all of you for your insight and all the great pictures of your dome building. We also hope to help others in their journey of building their dome home by our mistakes and triumphs along the way. They say the best way to learn is to get your hands dirty, well that is just what we did. Not to mention countless clothing, shoes and goggles. We have been working hard and have already learned a lot along the way. The main few being ……#1. Mother Nature will do what it wants, when it wants and #2. Your timing is NOT anyone else’s. Some people may or have called us “crazy” but we are the type who will work until we get the job done. Now, that is not to say, that we may not go crazy trying. We try to weather our mistakes and find solutions. The solutions have not always been what we envisioned, but we are looking at the big picture, the finished dome home. We pray to get there soon.